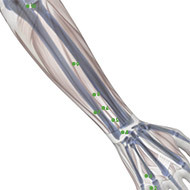 Triple Burner Meridian / Channel Acupuncture Points. This meridian contains 23 acupoints in one side, that is 46 acupoints in total. Location: On the lateral side of the ring finger, about 0.1 cun from the corner of the nail. Indications: Headache, redness of the eyes, sore throat, stiffness of the tongue, febrile diseases, irritability. Acupuncture Method: Puncture superficially 0.1 inch, or prick with a three-edged needle to cause bleeding. Moxibustion is applicable. 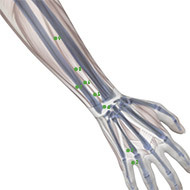 Location: When the fist is clenched, the point is located in the depression proximal to the margin of the web between the ring and small fingers, at the junction of the red and white skin. Indications: Headache, redness of the eyes, sudden deafness, sore throat, malaria, pain in the arm. 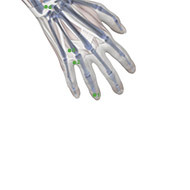 Acupuncture Method: Puncture obliquely 0.3-0.5 inch towards the interspace of the metacarpal bones. Moxibustion is applicable. 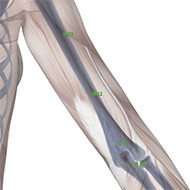 Vasculature: The dorsal digital artery of the ulnar artery. 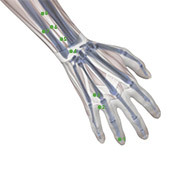 Location: When the fist is clenched, the point is on dorsum of the hand between the fourth and fifth metacarpal bones, in the depression proximal to the fourth metacarpophalangeal joint. Vasculature: The dorsal venous network of hand and the fourth dorsal metacarpal artery. Location: On the transverse crease of the dorsum of wrist, in the depression lateral to the tendon of m. extensor digitorum communis. Vasculature: The dorsal venous network of the wrist and the posterior carpal artery. Innervation: The terminal branch of the posterior antebrachial cutaneous nerve and the dorsal branch of the ulnar nerve. 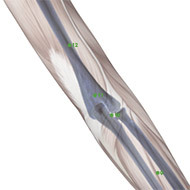 Location: 2 cun proximal to the dorsal crease of the wrist, on the line connecting Yangchi (TB-4) and the tip of olecranon, between the radius and ulna. Indications: Febrile diseases, headache, pain in the cheek, strained neck, deafness, tinnitus, pain in the hypochondriac region, motor impairment of the elbow and arm, pain of the fingers, hand tremor. Vasculature: Deeper, the posterior and anterior antebrachial interosseous arteries and veins. Innervation: The posterior antebrachial cutaneous nerve; deeper, the posterior interosseous nerve and the anterior interosseous nerve. 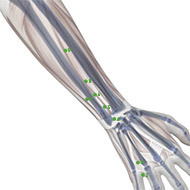 Location: 3 cun proximal to the dorsal crease of the wrist, on the line connecting Yangchi (TB-4) and the tip of olecranon, between the radius and ulna, on the radial side of m. extensor digitorum. 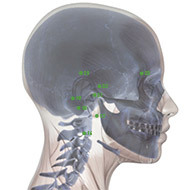 Regional anatomy: See Waiguan (TB-5). 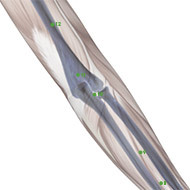 Location: At the level with Zhigou (TB-6), on the ulnar side of Zhigou (TB-6), on the radial border of the ulna. Vasculature: The posterior antebrachial interosseous artery and vein. Innervation: The posterior and medial antebrachial cutaneous nerves; deeper, the posterior and anterior interosseous nerves. 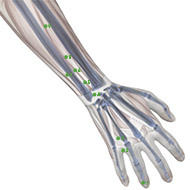 Location: 4 cun proximal to the dorsal crease of the wrist, between the radius and ulna. Regional anatomy: See Huizong (TB-7). 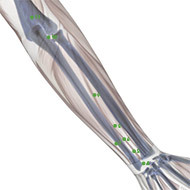 Location: On the lateral side of the forearm, 5 cun below the olecranon, between the radius and ulna. 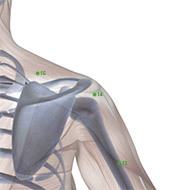 Location: When the elbow is flexed, the point is in the depression about 1 cun superior to the olecranon. Vasculature: The arterial and venous network of the elbow. Innervation: The posterior brachial cutaneous nerve and the muscular branch of the radial nerve. Location: 1 cun above Tianjing (TB-10) when the elbow is flexed. Vasculature: The terminal branches of the median collateral artery and vein. Location: On the line joining the olecranon and Jianliao (TB-14), midway between Qinglengyuan (TB-11) and Naohui (TB-13). Vasculature: The median collateral artery and vein. Location: On the line joining Jianliao (TB-14) and the olecranon, on the posterior border of m. deltoideus. 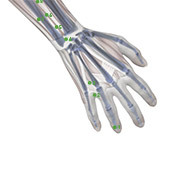 Innervation: The posterior brachial cutaneous nerve, the muscular branch of the radial nerve; deeper, the radial nerve. 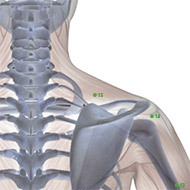 Location: On the shoulder, posterior to Jianyu (LI-15), in the depression inferior and posterior to the acromion when the arm is abducted. Vasculature: The muscular branch of the posterior circumflex humeral artery. 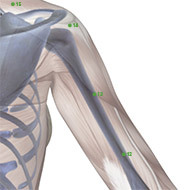 Innervation: The muscular branch of the axillary nerve. Location: Midway between Jianjing (GB-21) and Quyuan (SI-13), on the superior angle of the scapula. Vasculature: The descending branch of the transverse cervical artery; deeper, the muscular branch of the suprascapular artery. Innervation: The accessory nerve and the branch of the suprascapular nerve. 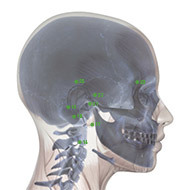 Location: On the lateral side of the neck, directly below the posterior border of mastoid process, on the level of the mandibular angle, and on the posterior border of sternocleido mastoid muscle. Vasculature: The posterior auricular artery. 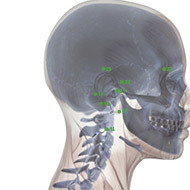 Location: Posterior to the lobule of the ear, in the depression between the mandible and mastoid process. 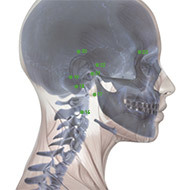 Indications: Tinnitus, deafness, otorrhea, facial paralysis, toothache, swelling of the cheek, scrofula, trismus. Vasculature: The posterior auricular artery and vein, the external jugular vein. Innervation: The great auricular nerve; deeper, the site where the facial nerve perforates out of the stylomastoid foramen. 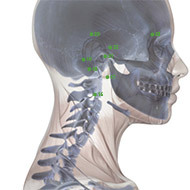 Location: In the centre of the mastoid process, at the junction of the middle and lower third of the curve formed by Yifeng (TB-17) and Jiaosun (TB-20) posterior to the helix. Acupuncture Method: Puncture subcutaneously 0.3-0.5 inch or prick with a three-edged needle to cause bleeding. Moxibustion is applicable. Innervation: The posterior auricular branch of the great auricular nerve. Location: Posterior to the ear, at the junction of the upper and middle third of the curve formed by Yifeng (TB-17) and Jiaosun (TB-20) behind the helix. Indications: Headache, tinnitus, deafness, pain in the ear, infantile convulsion. Innervation: The anastomotic branch of the great auricular nerve and the lesser occipital nerve. 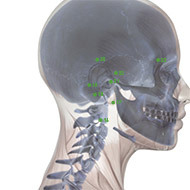 Indications: Tinnitus, redness, pain and swelling of the eye, swelling of gum, toothache, parotitis. Vasculature: The branches of the superficial temporal artery and vein. Innervation: The branches of the auriculotemporal nerve. 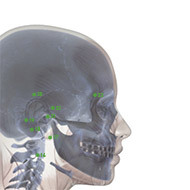 Location: In the depression anterior to the supratragic notch and behind the posterior border of the condyloid process of the mandible. The point is located with the mouth open. Acupuncture Method; Puncture perpendicularly 0.3-0.5 inch. Moxibustion is applicable. Vasculature: The superficial temporal artery and vein. Innervation: The branches of the auriculotemporal nerve and facial nerve. Location: Anterior and superior to Ermen (TB-21), at the level with the root of the auricle, on the posterior border of the hairline of the temple where the superficial temporal artery passes. 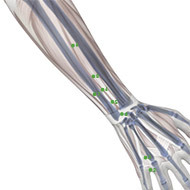 Acupuncture Method: Avoid puncturing the artery, puncture obliquely 0.1-0.3 inch. Moxibustion is applicable. 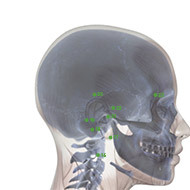 Innervation: The branch of the auriculotemporal nerve, on the course of the temporal branch of the facial nerve. Innervation: The zygomatic branch of the facial nerve and the branch of the auriculotemporal nerve.